As many as 100 dead animals -- and about 30 malnourished live ones -- were discovered Tuesday night on a farm near Summitville. 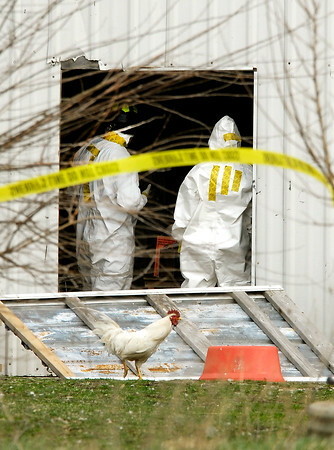 Investigators dressed in hazmat suits work in one of the barns Wednesday where the remains of as many as 100 animals were found dead Tuesday night at a farm on County Road 1700 North near 350 West. One of the surviving roosters wanders by out front looking for food.